NATIONAL brands not yet established on the Coast and some grown from the region will be among the tenants at a new shopping centre expected to open before Christmas. Stockland Sunshine Coast regional manager Ben Simpson said he couldn’t yet reveal which tenants would join Coles and Aldi at Birtinya Shopping Centre. But he said the announcements would be exciting. “There has been a fair bit of work not just trying to get brands from outside the Sunshine Coast,” he said. The centre is the first stage of the broader $830-million Birtinya Town Centre masterplan development. It will also include high-density residential development with a new civic plaza, walkable waterfront along Lake Kawana and open green space. Stockland estimates the town centre development will generate more than 550 construction jobs and more than 14,600 new full-time jobs on completion. New streets are also being created while construction of the shopping centre takes place. 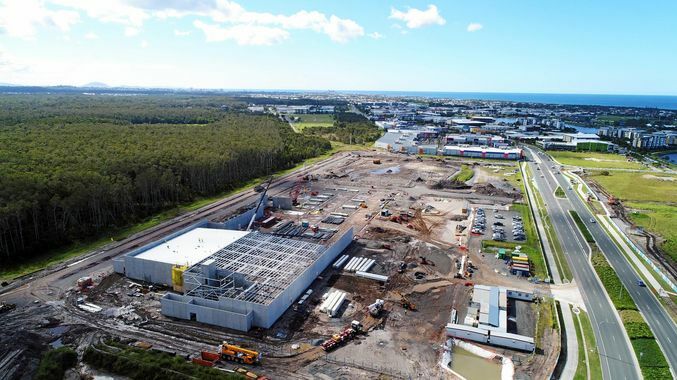 Station Rd, which will connect with Kawana Way, loops around the western edge of the shopping centre and then connects back with Kawana Way, is being built. Its name has come from a future rail station planned to be built on the shopping centre’s western boundary. Work is also under way on The Avenue, which will cut through the centre between Station Rd and Kawana Way.